Sound familiar? You’ve found the perfect main course, but the recipe yields eight servings and you’ve invited a dozen dinner party guests. Time to start thinking about cooking conversions. Stephanie Rensing used to lug her laptop into the kitchen when she wanted to look up conversion tables, but electronics and messy ingredients don’t mix very well. 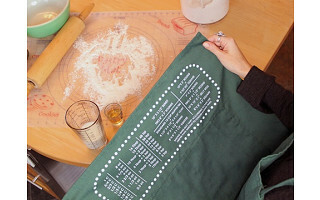 Her husband Daniel designed a clever apron with common conversion tables printed upside down so it’s easy for the apron wearer to sneak a peek at the information. The apron was a hit, and it sparked The Smart Baker, a new business venture for the husband-and-wife team. A handy complement for the Smart Baker apron is the nonslip Kitchen Helper Pastry Mat, printed with sizing graphics so you can roll the perfect dough, cookies and pie crusts. If you’re ready to upgrade a kitchen staple, the two-cup Measuring Glass is a sturdy classic. Its junior companion, the Mini Measure Shot Glass, brings something new to your arsenal of kitchen tools. It looks like a shot glass and has markings on the side for measuring teaspoons, tablespoons, ounces and milliliters. An easy alternative to measuring spoons, the Mini Measure is ideal for doling out medicine, too. With the right tools at your fingertips, cooking is a whole lot more fun. One challenge my wife always had was finding a recipe that yielded just the right amount. When we'd baked for ourselves, we'd scale recipes down considerably. When we were making treats for our large families, we'd always have to scale the recipes up. In the process, we would always need to convert measurements for an easier and faster way to measure out their ingredients. One day, I made Stephanie an apron with the measurement conversions printed upside down for easy reading. And thus, The Smart Baker was born. We are glad that Daily Grommet has allowed us to share this apron with you. Is the conversion table on the apron printed upside down? So flipping up the hem, the cook could look at it from their end. @jolie, That is correct! All they would need to do is lift up and look down. @Darlene Chartier: The aprons were responsibly made overseas, and the screen printing of the charts was done here in the USA. Currently, the colors available are red, navy and green. You can look at the photos of the colors on The Smart Baker webpage (under the video). Thank you for your interest. This is my favorite apron, not only do I constantly use the conversions but it adjusts around the neck and waist so it always keeps me well covered!! Thank you Smart Baker!! I absolutely love this apron! I bought a couple to give as gifts to my sister and sister-in-law who both love to bake, they were tremendous hits! I love the Smart Baker and all of their innovative products for the kitchen. Can't wait to see what's next! Reducing an 8-serving recipe calling for, say, 2/3 cup of an ingredient, down to a 2-serving recipe, gives me a headache. Does your apron help with this? Also, are your products made in America? Thanks. Hello Connie! Our apron was made specifically for that problem. One fourth of 2/3 cup can now be converted using our apron. Simply find 2/3 cups, look across and find a number that is easily divisible by 4. In this case 2/3 cups equals 32 tsp, so one fourth of 32 is 8tsp. And now you have your conversion. Our aprons were responsibly made overseas, and the screen printing of the charts was done here in the USA. Great Question! The apron strings length will depend on how high you wear the apron. Since the apron's neck adjust by pulling on the one-piece ties, the amount of waist tie available may vary. We have seen people able to tie it off in the front or side, but it will depend on the person. @Daniel Rensing: What is the width of the apron and the length of the tie strings? I love the adjustable neck feature, by the way. Great for when there is more than one cook in the house! @Rhonda S.: The overall width of the apron is 20". The overall length of the tie is approx. 100" longs. That is the total length. One average there is usually about 23"-26" of tie available around the waist. I am very interested in the measuring cups. I tried to place an order, but there is a message that it is unavailable. When will I be able to order them? @Donna Dockins: Hi Donna! They should be available. I will contact you directly to make sure you can order them. I've been trying to order the measuring cups as well, and keep getting a message that they're unavailable. Are they backordered? @Susan Stiles: Unfortunately, they are out of stock. We hope to get more back in stock soon. @Faith Williams: Thank you for your interest. We'll be sure to contact you directly once the measuring cups are available. Sound familiar? You’ve found the perfect main course, but the recipe yields eight servings and you’ve invited a dozen dinner party guests. Time to start thinking about cooking conversions. Stephanie Rensing used to lug her laptop into the kitchen when she wanted to look up conversion tables, but electronics and messy ingredients don’t mix very well. 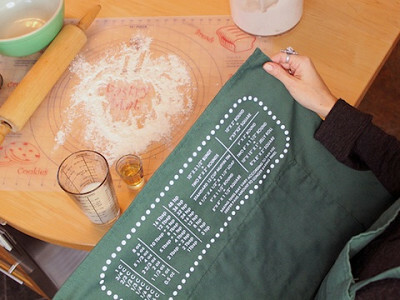 Her husband Daniel designed a clever apron with common conversion tables printed upside down so it’s easy for the apron wearer to sneak a peek at the information. 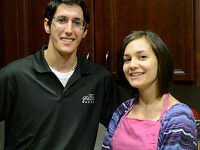 The apron was a hit, and it sparked The Smart Baker, a new business venture for the husband-and-wife team. A handy complement for the Smart Baker apron is the nonslip Kitchen Helper Pastry Mat, printed with sizing graphics so you can roll the perfect dough, cookies and pie crusts. If you’re ready to upgrade a kitchen staple, the two-cup Measuring Glass is a sturdy classic. Its junior companion, the Mini Measure Shot Glass, brings something new to your arsenal of kitchen tools. It looks like a shot glass and has markings on the side for measuring teaspoons, tablespoons, ounces and milliliters. An easy alternative to measuring spoons, the Mini Measure is ideal for doling out medicine, too.